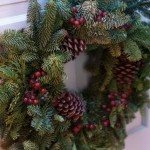 Many of us decorated for the holidays with live evergreen boughs, wreaths, trees or garland. While we enjoyed their fragrance and festive atmosphere, what can you do with evergreens now? Place branches over shallow rooted plants such as mums, coral bells, strawberries and spring bulbs to insulate their roots through freezing and thawing. Acid loving plants such as rhododendron and holly appreciate a layer of evergreens as the needles add a slight acid boost. When picking them up in the spring, give boughs a shake to let the needles fall and mix in to your mulch. Mulch Endless Summer hydrangea and other varieties of Hydrangea macrophylla. The boughs will add another layer of protection over their flower buds for next year. Tender roses such as hybrid teas, grandifloras and floribundas do well with a layer of compost, then leaves or straw and a final layer of evergreen boughs. Mulch them now. Rabbits will avoid treading on sharp evergreen needles. Layer boughs around some of their favorite shrubs such as fothergilla, roses, and viburnum. Rabbits may also sample the bark of fruit trees and berry shrubs. After the holidays, place your cut tree out in the garden as a shelter for birds. Choose a back corner or out of the way place and birds will welcome the additional shelter from winter weather and predators. The tree will stay green for most of the winter and can be cut up and added to the compost pile in the spring. Pretty up your beds, especially around your entranceways with a layer of evergreen boughs. Mix and match different kinds for a richer look and perhaps add some red or yellow twig dogwood stems for a little bit of color. You can easily create a natural winter look to enjoy until spring. So instead of taking your tree to the curb, enjoy the benefits of using evergreen boughs in your garden.